By 2030, the tri-state region should be producing half of all its electricity from renewable, clean power sources such as solar and offshore wind to keep us on a path to sustainability. While rooftop solar panels are increasingly popular, large-scale solar and offshore wind projects remain largely conceptual. States and energy companies should take aggressive steps to make the region both a leading user and supplier of renewable energy. The region can sharply reduce greenhouse gas emissions by expanding state renewable portfolio standards, restructuring energy markets to factor in renewables, planning for land use and economic development opportunities and using the purchasing power of large cities. Innovations in battery storage and other energy technology are making renewable energy increasingly competitive. Rebates and policies allowing homeowners to sell power back out to the grid have helped to expand distributed solar generation. But no large-scale solar and offshore wind farms exist today in the region. In 2017, the Long Island Power Authority approved the nation’s largest offshore wind farm: 15 turbines capable of powering 50,000 homes. The electricity grid in its current form isn’t designed to efficiently integrate renewables, which generate power intermittently, with existing power sources. At the same time, New Jersey and Connecticut haven’t taken aggressive steps to signal market changes, such as restructuring how non-utility distributors are paid for power generation. All three states have not made nearly enough direct investments into renewable energy project planning nor have they helped municipalities to coordinate land use and economic development opportunities for renewable generation. New York State has been leading the region, most notably through its renewable energy goals and its Reforming the Energy Vision strategy. About 23 percent of its energy comes from renewable sources, primarily hydropower. In 2016, New York State established nation-leading goals for clean energy (50 percent by 2030) and offshore wind (2,400 MW by 2030), though the path to implementation is unclear. New York City, similarly, has established an ambitious 100 percent renewable energy target, but has taken few steps toward implementation. New Jersey, which gets about 5 percent of its energy from renewable sources (mostly solar), adopted ambitious legislation a decade ago and successfully established the state as a solar leader. It has languished since then, losing opportunities to lead in other areas, such as offshore wind. Nearly half of New Jersey’s energy comes from nuclear energy, which emits nearly zero greenhouse gases but has other environmental impacts. Connecticut, which gets less than 5 percent of its energy from renewable sources and more than a third from nuclear, has been successful at advancing some small- to mid-sized renewable energy projects through its Green Bank, but is not a renewable energy leader. With new policies and investment to promote the production of renewable energy and consumer demand, the region can reduce greenhouse gas emissions and take advantage of opportunities to create new energy-related jobs. Large arrays of solar panels or farms of offshore wind turbines hold tremendous potential for economic growth. 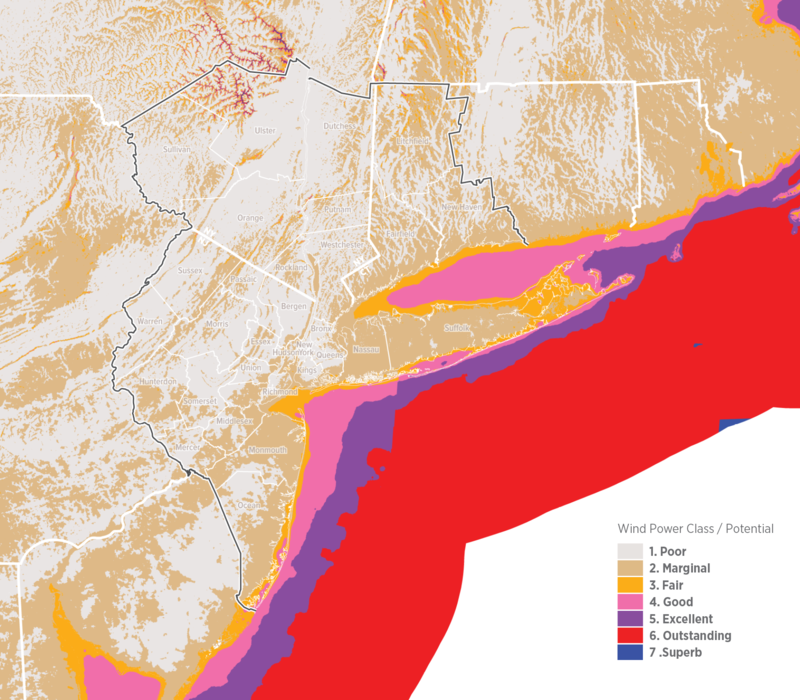 The three states, New York City, regional entities like the Port Authority and coastal municipalities should collaborate to bolster a home-grown offshore wind industry, by determining ideal sites for offshore wind turbine construction, partnering with manufacturers to build local supply chains and encouraging institutions of higher education to focus on this important resource. The three states should also work closely with local communities to determine the land use opportunities and implications for large solar farms, by collaborating with grassroots organizations on education and economic development to develop long term plans for how land could be used to host solar arrays. In 2016, New York State updated its Renewable Portfolio Standard (RPS) from 29 percent to a 50 percent Clean Energy Standard for renewable energy by 2030 along with the multi-year collaborative process called Reforming the Energy Vision (REV) that aims to modernize the grid and create more competitive markets for renewable energy. New Jersey and Connecticut should follow suit and raise their standards to 50 percent by 2030. Currently, New Jersey’s Board of Public Utilities currently has an RPS of just over 20 percent by 2021, with an additional solar requirement of 4 percent by 2028. Connecticut’s Public Utilities Regulatory Authority has RPS of 27 percent by 2020. Both states should look at lessons learned from REV to date, and develop a process tailored for their own needs and aspirations to enable and facilitate the increased deployment of distributed renewable energy. As some of the largest energy purchasers, the region’s cities have the ability to influence the energy supply mix through what they buy. In 2015, New York City, which spends upwards of $650 million per year on electricity, requested proposals for ways that city operations could be run on 100 percent renewable resources from new power generation. While none of the proposals has moved forward to date, the concept should be acted on in New York City and pursued in other large cities. The MTA is also a major consumer of power, spending $400 million a year on electricity. The agency’s focus has been on finding ways to conserve power, but could use its leverage as a big customer to promote renewable energy. Scaling up renewable energy in the region would have many benefits, including reducing greenhouse gas emissions and helping states reach their emissions targets. Renewables, which contribute little or no air pollution, would also help meet energy demand while also improving air quality. Renewable energy could boost economic development through the manufacture and construction of solar panels, wind turbines and other equipment, and provide green-collar jobs in the region. Contracting opportunities generated by the transition itself could be geared toward including advocacy and grassroots perspectives, such that green jobs are created and aid historically burdened community residents. Creating more renewable energy sources would require trade-offs that balance competing land uses, in particular for large solar arrays and storage facilities that would affect communities. States, local municipalities and energy companies should engage residents and stakeholders in assessing costs and benefits. Investments in new infrastructure will be needed from both the private and public sectors. More importantly, increasing renewables will require government to change the way the economy recognizes the value of these resources in terms of sustainability, operational flexibility and resiliency. New York’s REV initiative is one example of an effort to create a new framework in which renewable energy and distributed generation are the norm and derive from customer and investor actions, rather than ad hoc, short-term government subsidies. Broader-based pricing of carbon, and added valuation of flexibility and responsiveness in wholesale markets – of storage, for example – are additional initiatives that will facilitate and encourage investment in renewables. In addition, underlying investments in a smarter and more flexible grid funded through regulated utility investment, as well as other enabling infrastructure funded through other public support, would be necessary to enable the maximum deployment and efficiency of new renewables and distributed generation. Federal credits, such as the solar tax credit, in combination with state net-metering policies have helped solar to gain a foothold, particularly at the residential level. Continued credits, combined with additional state incentives and policies, will be needed to advance large-scale solar and offshore wind projects. Proceeds from an expanded greenhouse gas market, would help build a growing reserve of capital to invest into such projects. Private renewable energy companies are already investing in projects on the leading edge of a new economic success story, and should continue to lead the way.